Last Saturday morning, a large crowd of Beaverton citizens gathered at the S.P. Depot to welcome the first electric train excursion over the PE&E. tracks, and at 8:45am, mid the cheering of 400 throats, and to the entrancing strains of the famous Beaverton military band, the Portland Commercial Club, railroad officials, and prominent newspaper men of Portland and Washington county came into the gateway to the greatest counties in Oregon. President Piper made a splendid address, and Honorable W.0. 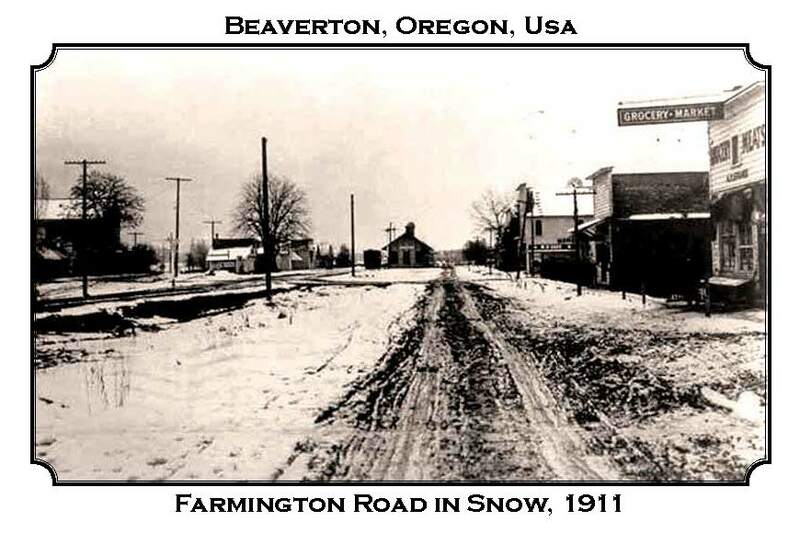 Hocken, mayor of Beaverton, responded with a royal welcome to the greatest Garden City in the state, “where King Horseradish governs the day and Queen Onion rules the night,” and the subjects of this dominion are the happiest people on earth. The big red [train] cars, to the stirring tunes of the band, then departed for the carshops [to be] thoroughly inspected. Then the train departed on a round of welcomes at Tigard, Tualatin and Sherwood, “Home of Onions.” Seemed everybody at these places were at the depots ready with a glad hand, and at Sherwood, the “Beaverdam Diamonds,” commonly known as onions (now $3.25 per sack), were passed around as souveniers; and W.O. Hocken with others was photographed with a big onion in his hand. Here the excursion passed through another grand county, “Old Yamhill,” eating lunch at Newberg. At McMinnville, a big parade was on the program, and the McMinnville band took the lead at the royal entertainment. Coming down the line to Gaston, Dillev, Forest Grove, Cornelius, Hillsboro and Reedville, at everyone of these cities, enthusiastic crowds lavished out the best of entertainments and glad greetings. Even Aloha had a big bonfire, and the folks stayed till morning” singing the praises of that new depot they are expecting. Truly in a broad sense, the “coming of the red cars” means millions to the Willamette valley. 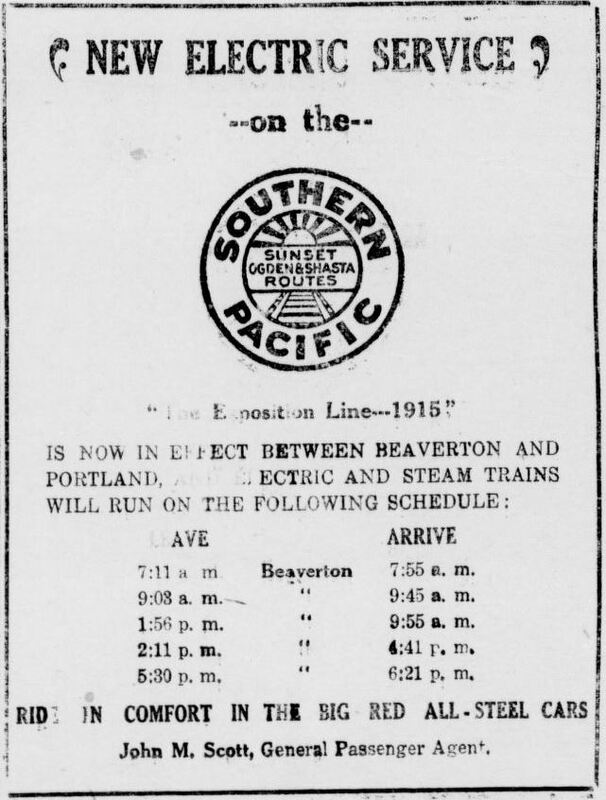 One great project of 1914 that is of vital interest to this end of Washington County is the proposed county road, between Beaverton, St. Mary’s, Huber, Aloha and Reedville, due east and west paralleled with the S.P. track. The future welfare of the prosperous towns, above-named, would be greatly promoted by direct communication on a skyline road, well rocked, and The Owl believes now is the time to commence boosting the project through. Let the Commercial Clubs of these cities petition the County Court for immediate action. It will be easy to rock by distributing rock from the S.P. track, adjoining to where needed.